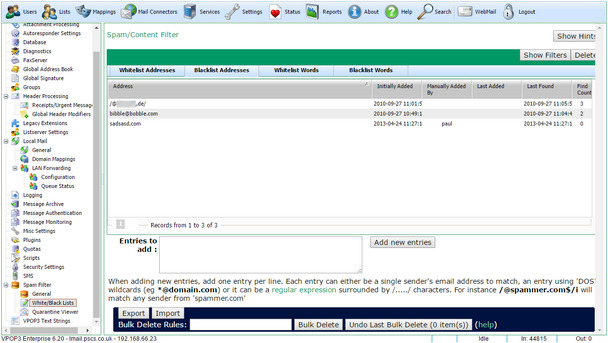 The Spamfilter Blacklist Addresses list contains sender email addresses which you want to be blocked by the spam filter. Generally, adding entries to the blacklist is not very useful because most spammers will fake the sender email address and generate random sender addresses. The table shows the entries already in the blacklist. •The Address column shows the email address. •The Initially Added column shows when the address was initially added to the whitelist. •The Manually added by column shows who manually added the address. •The Last Added column shows when the address was last added since it was initially added. •The Last Found column shows the latest time when the address was found as the sender of an incoming message. •The Find Count column shows how many times the the address was found as the sender of an incoming message. You can add new blacklist entries by typing them into the Entries to add box (one entry per line) and pressing the Add new entries button. The Show Filters button will display boxes in the table headers where you can type search criteria. In the Find Count filter box you can use numerical expressions, such as '<10' or '>100' etc. The Export and Import buttons let you export or import the blacklist entries to a text file. The Bulk Delete Rules let you specify a rule to delete many blacklist entries at once. Do not put spaces around comparators, or after the colon character. Eg addedby:fred* is valid, addedby: fred* is not and will be treated as two separate conditions. For ages, VPOP3 recognises the periods: minutes, hours, days, months, years (the 's' at the end is optional). You should separate multiple conditions with space characters. All the specified conditions must match for the entry to be deleted. Once you have specified the conditions and pressed 'Delete', VPOP3 will tell you how many entries will be deleted, and will give you some examples of the entries which will be deleted. You can then confirm the deletion. If you find you have made a mistake, you can use the Undo Last Bulk Delete button to undo the latest bulk deletion (this only stores the deleted data for one day or until VPOP3 is restarted, whichever is the sooner).